My pieces are inspired mainly by the colours and textures of nature and the seascapes of this beautiful island. The influence of travelling and experiencing a variety of environments and cultures is also reflected in some decorative and sculptural work. I create original hand-built pieces - some functional and some purely ornamental - and use a variety of slips, oxides, stains and glazes as well as natural materials for decoration. 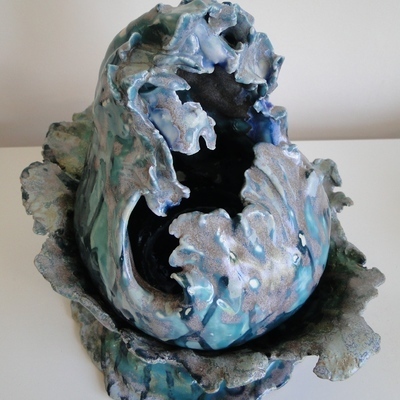 I have been making and exhibiting ceramics since 2004 studying initially through part-time commercial courses throughout the UK and then at City Lit and The American Art Academy. Since retiring and moving permanently to the Isle of Wight I have been able to build my own studio and spend time developing an organic style and exploring the use of natural materials found locally in the hedgerows and on the beach. A more light-hearted design I am currently working on is a range of pieces depicting querky beach huts a few of which were displayed in late 2018 at Art4Sail in Cowes. I am looking forward to this year's Open Studios and to sharing my work with visitors and hearing their views.